Born in 1921, to the late Frank and Mary (Goldon) Millman, he was a lifelong resident of the St. Louis area until moving to New Jersey in 2017. He passed away peacefully at the home of his son, Gregory, January 8, 2019. Predeceased after 65 years of wedded bliss by Celeste (nee Dollard) Millman, he was the dear father of Gregory (Martine) and James Millman, beloved grandfather of Bridget, Tayler (Matt) D’Rion, Anna (Allan) An, Magdalen, Chazz, William, Joseph, Gregory Blaise, Tristan, and Asher Millman, and the late Beau Millman, and great grandfather of Jaxton, Chase and Shane D’Rion. His stepfather, George Wright, and sister, Frances Kneffel, predeceased him. 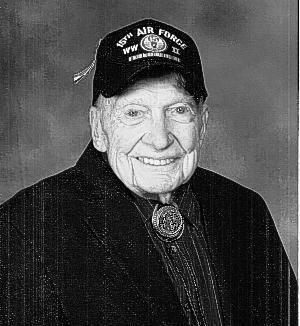 He bravely served in the Fifteenth Division of the U.S. Army Air Forces in World War II. After graduation from St. Louis University he worked at B.C. MacDonald from 1953 until 1990, retiring as Chief Financial Officer. A founding parishioner at St. Clare Parish in Ellisville, he attended daily Mass for decades at the Passionist Nuns Chapel, assisted by friends and neighbors when he could no longer drive. Services: Visitation will be held on Monday, January 21 at The Pointe at Ballwin Commons, 1 Ballwin Commons Circle, Ballwin, MO 63021 from 5:30-7:30 p.m. The Funeral Mass will be held on Tuesday, January 22 at 11:00 a.m. at St. Clare of Assisi Catholic Church, 15642 Clayton Road, Ellisville, MO 63011. Interment to follow at Holy Cross Cemetery. In lieu of flowers, donations to the Passionist Nuns of St. Louis, 15700 Clayton Road, Ellisville, MO 63011 preferred. Visitation will be held on Monday, January 21 at The Pointe at Ballwin Commons, 1 Ballwin Commons Circle, Ballwin, MO 63021 from 5:30-7:30 p.m. The Funeral Mass will be held on Tuesday, January 22 at 11:00 a.m. at St. Clare of Assisi Catholic Church, 15642 Clayton Road, Ellisville, MO 63011. Interment to follow at Holy Cross Cemetery.